Root canal treatment can help save teeth that have become infected or inflamed. Our Billerica, MA, dentist, Dr. Kunio Chan of One Dental Care, discusses a few signs and symptoms that may occur if you need a root canal and explains what happens during the therapy. Pressure causes pain. Pressing on the tooth or chewing on it can trigger pain. Pain never goes away. Whether you have constant or intermittent pain, pain may have become an unwelcome part of your life. Severe pain occurs suddenly. Sudden, severe pain may be a sign of an abscess, a bacterial infection in your pulp. Pain is often accompanied by a fever, swollen lymph nodes and facial swelling. In addition to a root canal, you'll also need antibiotics to ensure that the infection doesn't spread to other parts of your body. Temperature changes cause pain. Infected or inflamed teeth are often very sensitive to hot and cold temperatures. Your morning cup of coffee or nightly bowl of ice cream can cause pain that lingers for about a half hour. Your gums are swollen. 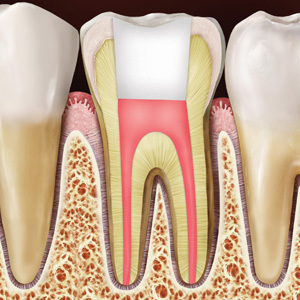 Swelling in the gums around your tooth may occur if you need a root canal. If a small pimple forms on the gum, you may have an abscess. Your tooth has darkened. A color change may occur if you experience inflammation or infection in your tooth pulp. How do root canal treatments help? Root canal therapy eliminates the source of your pain by removing the pulp. Luckily, your tooth can function normally even if the pulp has been removed. After you receive a local anesthetic, your tooth will be opened to reveal the pulp. In addition to removing the pulp, the inside of the tooth and the root canals will be cleaned and shaped with a tiny file. After the tooth drains, you'll receive a flexible, rubber-based filling. In most cases, you'll need to return to our Billerica office a few weeks after your root canal therapy to receive a crown that will help protect your tooth. Are you concerned about pain or symptoms? Call our Billerica, MA, dentist, Dr. Chan of One Dental Care, at (978) 667-0691 to schedule an appointment.